The launch of Intel's Core 2 processor was a rude shock for AMD, at the time happily extracting top dollar from PC enthusiasts for its Athlon 64 X2 dual-core chips. Now you can buy this mid-range X2 for just £123, including Chancellor Brown's pound of VAT flesh. Remarkable. As part of an economy drive, AMD has dropped most of its 2MB cache processors. So, the 4600 plus makes do with just 512k per core while the Core 2 Duo packs at least 2MB. 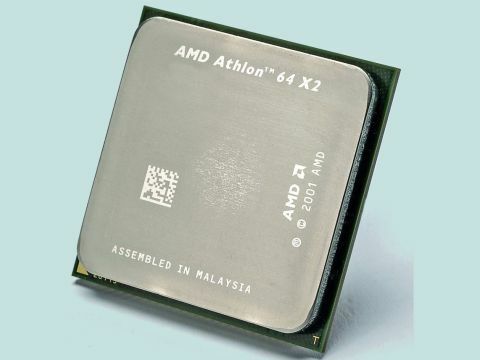 But such is the efficiency of the Athlon 64's highly integrated architecture, the stingy cache memory has little impact on performance, which falls somewhere between the Core 2 Duo E6300 and E6400 chips at stock clock speeds, as it does in terms of price, too. However, when it comes to overclocking prowess, it gets monstered by its Intel nemeses.